Everybody's looking for a good exercise routine. So, what constitutes a good routine and workout? Well, after years of doing exercises that didn't work well for me I found that a good Pilates routine is the best way to do exercise. It is well rounded, fun, didn't hurt after, and didn't take up a lot of my time. One exercise flows into another with a low number of repetitions and high quality moves. The single and double leg stretch, shown here, is a good example of this method, flowing one into another. 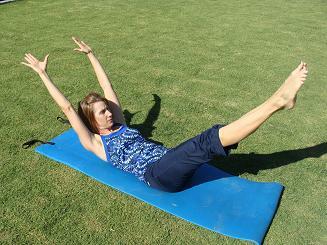 They offer a great way to stabilize your core muscles while simultaneously stretching your arms and legs. You can see the double leg stretch and more from my exercise of the month pages. 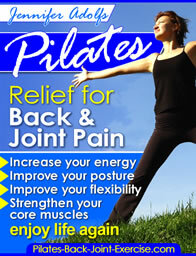 Pilates does a great job of combining these two important exercise components in each routine so you aren't sore later. The beauty of Pilates is that it helps to work the length tension imbalances in the body, it stretches the tight muscles and strengthens the weak ones. One of my favorite ways to do this is with the Eve's Lunge on the Reformer shown below. This exercise stretches the hip flexors and hamstrings while simultaneously strengthening the quadriceps. Each movement employs intentional focus along with very conscious breathing cues. The Teaser is a perfect example of an exercise that employs mindful focus to help achieve balance and better body awareness. Pilates exercises leave you feeling invigorated and full of energy, not run down and exhausted. Some of my favorite Pilates workout routines involve using the exercise ball. The ball is fun, challenging, and you can work the whole body in 10 minutes! Check out one of my favorite ball workouts here. You can do a little or a lot to suit your workout time frame. Some of us only have 10 minutes at a time and others want a full hour. Pick your time frame and then decide which exercises you want to do in your good exercise routine using some of my favorite Pilates exercises found on this site. You can do a good exercise routine using Pilates anytime, anywhere. Just get on the floor, bed, or even a rock out in the wilderness!